I have crocheted for over 20 years. I love it. And I always enjoy sinking my crochet hooks into a new pattern. 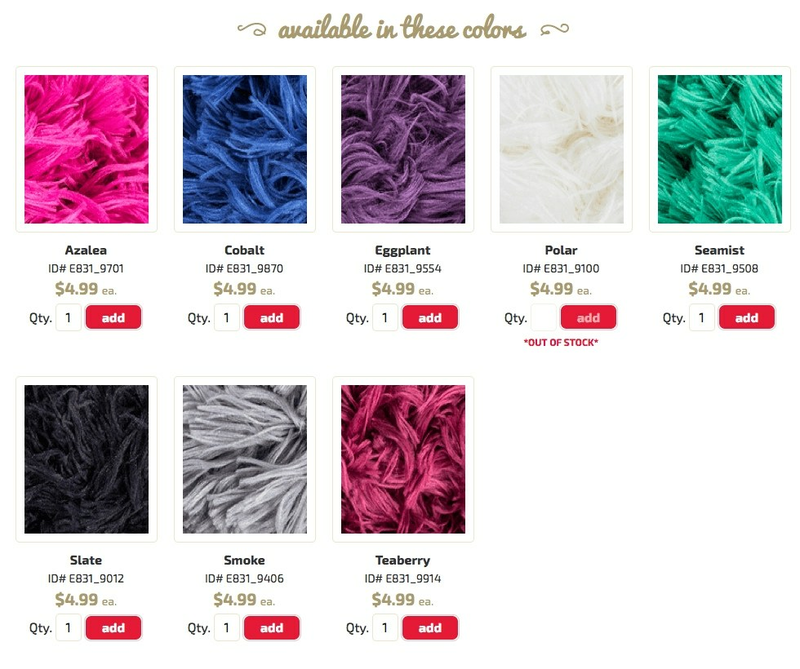 One of the crochet and knit newsletters I subscribe to is from RedHeart.com. 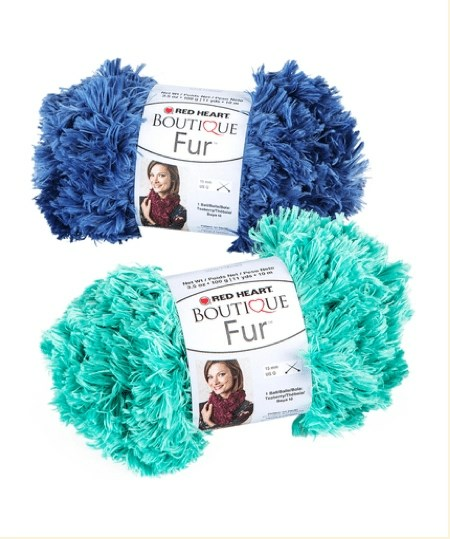 These Fur Top Holiday Stockings were featured in their recent 12 Weeks of Christmas series that was a part of that newsletter. 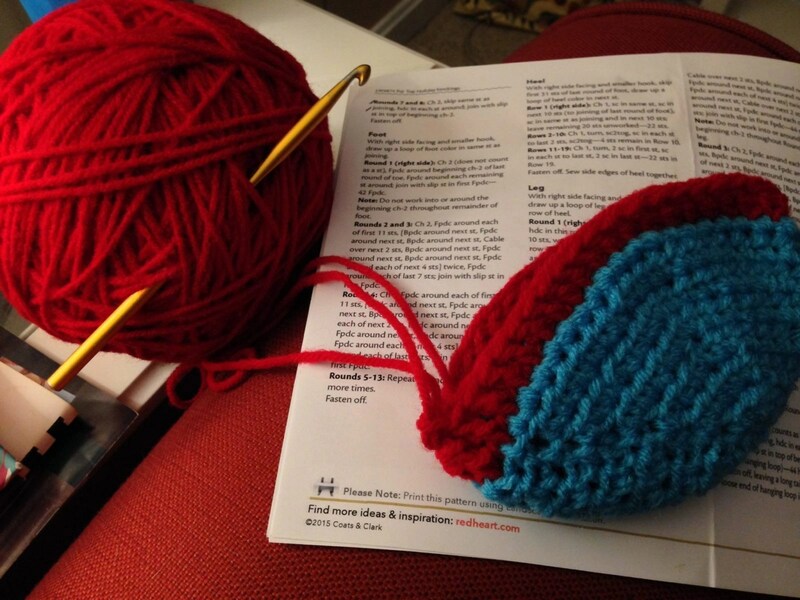 If you’re into crochet or knit projects, their newsletter is a great place for inspiration and I highly recommend signing up to receive it. They don’t send a million emails. And some of those emails I trash if they don’t contain something I’m interested in. The ones I do keep get filed in an email folder so I can go peruse them easier, at my own leisure. I’ve wanted to make my kids new Christmas stockings for a long time now, but never came across a pattern that grabbed my attention the way this one did. I love the color scheme, the fur topping (looks hard but is not) and the pretty cabling pattern that is more eye-catching than a simpler stitch. Initially, I was going to make the color scheme on the left, mostly turquiose with red heel and toe. But, by the time I got to the point of actually starting the project, I’d changed my mind and decided to do the red stocking with turquoise heel & toe. It felt a little more festive. This initial stocking was for my oldest daughter. However, I wanted to do different colors for each of my three kids. 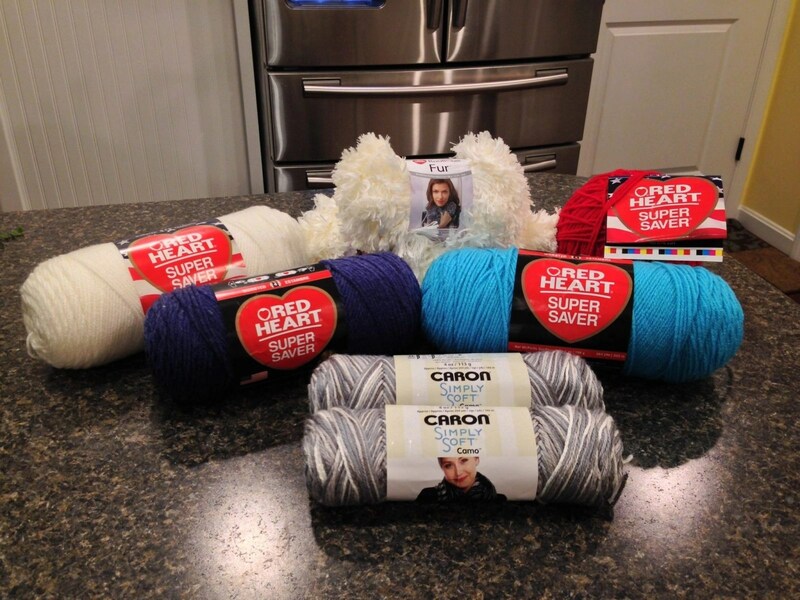 So, with the pattern in hand, I headed for Michael’s to see what would grab a hold of me in the yarn aisles. The pattern calls for Red Heart Super Saver yarn for the body, heel and toe sections and Red Heart Boutique Fur for the top. What you see here is all the yarn I bought for three stockings. I substituted the grey and white Caron Simply Soft yarn for one of the stockings, which is a bit smaller in diameter than the Super Saver, so I knew for that stocking I might have to make some adjustments (meaning adding extra rows to the top of the stocking) to make it look more similar in size to those stockings made with the Super Saver, but it was what called out to me for my youngest daughter, so I went with it. Since the skeins were a little smaller, I bought an extra in case I needed more than the one skein to complete the project. I don’t always love buying extra skeins when I’m not sure I’ll need them, but I never throw the leftover yarn from any project out as it can come in handy for other projects sometimes. So, it won’t get wasted. I’ll do something with it at some point. The fur yarn is not a bright white, it’s like an off-white, so it coordinated well with the Soft White yarn used for the heel and toe of the stockings for my younger kids. I really, really loved the grey scheme and would have loved to start with that one. But, I decided to start with the stocking made with the colors and brand of yarn called for in the pattern so I could compare my work-in-progress to the pictures in the pattern to make sure I was coming out with a stocking that looked right. Besides, I needed to complete one of the stockings with the recommended yarn so that when I got to the one using a different brand I could make the necessary adjustments for size. So, here’s me beginning work on the first stocking. So far, so good! The stocking is worked from the toe up the foot to the heel and then up the leg to the top. When finished with the toe, you fasten off that color yarn, attach the yarn for the foot, fasten off, attach yarn for the heel, fasten off, attach yarn for the leg and then you’re in the home stretch! The fur topping looks really complicated, but it’s just one round of double crochets all the way around the top of the stocking. Since the fur is, well, furry (LOL) you can’t really see what you’re doing with it and it requires some finger touch to make sure you’re getting it done right. But, it’s not too hard once you get the hang of the yarn and it’s only one row, so it’s over pretty quickly. So, here they are in all of their beautimous glory! I can’t really say how long they took. I worked on these after dinner while watching TV, but I didn’t work on them every evening. I do have to say that the foot and body are the same three rows over and over so I didn’t have to consult the pattern for every row as I was guided by the row before in terms of where to do the front post and back post double crochets and the cabling. It was the perfect kind of pattern to work on while watching TV because I could look at the crochet and kinda listen to the TV and look up and down between the two with ease. Finished measurements (as stated in pattern): One stocking measures about 20” (51 cm) long and about 12” (30.5 cm) around leg. I didn’t measure mine, they looked plenty big to me, though! As I thought, with the grey and white stocking being a different sized yarn, I ended up adding an extra set of the three row pattern repetition to make it taller and more in line with the size of the other stockings. But, even still, I didn’t have to use very much of that second skein of that color, at all. I have darn near the whole skein left! 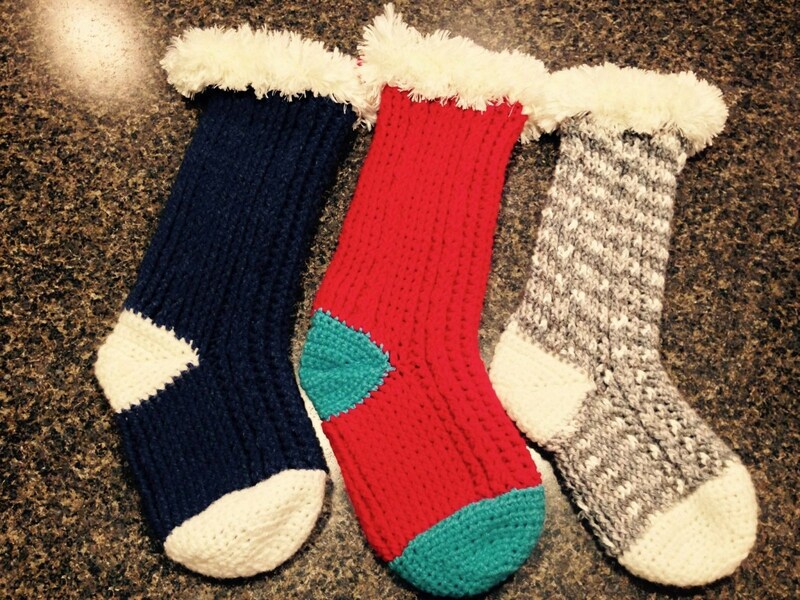 I enjoyed making these Christmas stockings so much and am pretty bummed that the project is over. 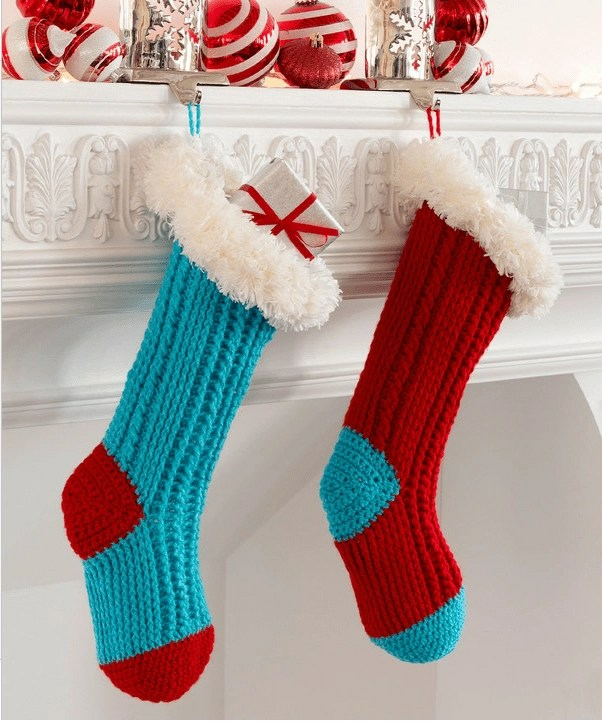 However, I’m thinking about making stockings for my nieces and nephews for next Christmas. Check out the pattern for these beautiful stockings HERE on the Red Heart website. 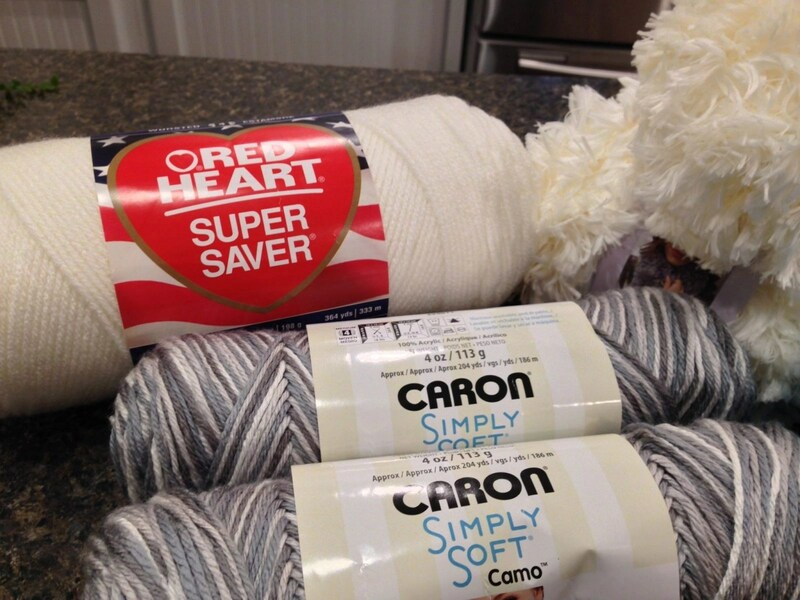 If you crochet, and you decide to give these a try, I’d love to see how yours turn out! You can send pics to me via email at reignbough1973 at yahoo dot com. Next up, I’m going to be working on cutting this pattern size down in half to make smaller stockings that would be suitable for baby’s first Christmas, gift giving like to your office coworkers, donating to local foster care agencies, etc. I used to work in foster care so I have a particular agency that I used to be employed by in mind for this project for next year. 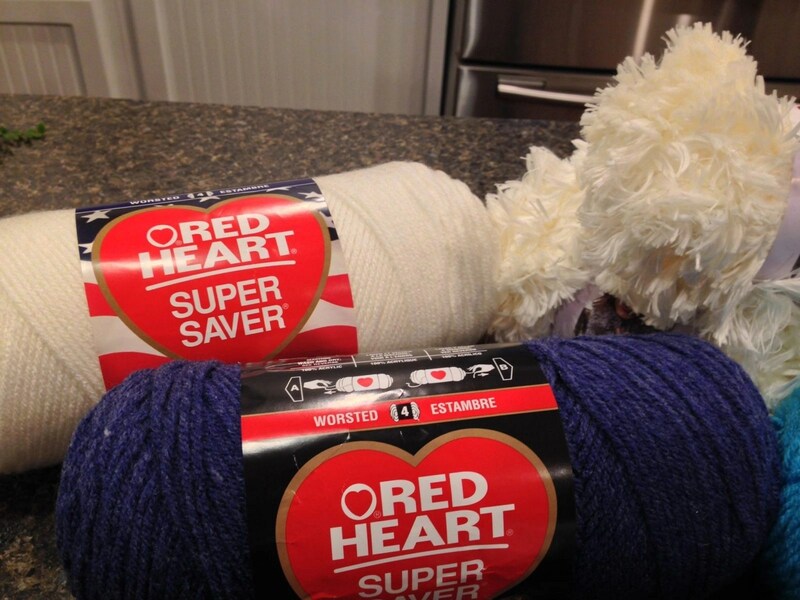 I’d also like to experiment with making soft white stocking bodies and doing some coordinating color for the toe, heel and fur topping because the boutique fur yarn comes in other colors (see below). So, there are a gazillion different ways this stocking can be made and it can be customized to everyone’s color preferences. I can’t wait. This is gonna be fun!!! Disclaimer: I have no material connection to the brand mentioned in this article. No compensation whatsoever was received in exchange for writing it. 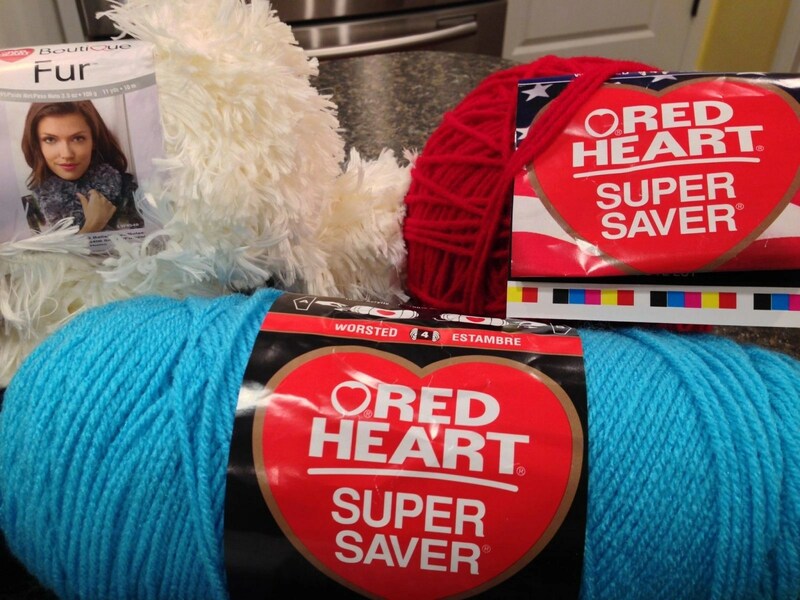 I personally, at my own expense, purchased the yarns shown to make stockings for my own children. All opinions expressed are 100% my own.